Our CNC Vertical Machining Department consists of both Vertical Machining Centers and CNC controlled drilling and tapping machines. While these machines are similar, their differences complement our manufacturing process. Our Brother CNC drill and tap machines have extremely fast rapid rates and one of the quickest tool change times in the industry. 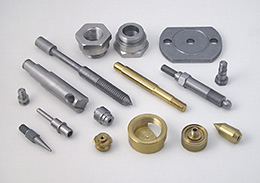 These machines allow us to provide our customers with cost effective, high quality small parts that require drilling, tapping and light milling. In contrast our Haas Vertical Machining Centers produce larger parts that require more aggressive machining. In addition our vertical machining centers are outfitted with a fourth axis which is used to generate flats, hexagons, squares, oil grooves and spirals. 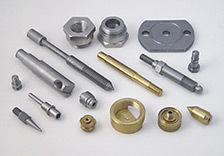 Regardless of your lot size, our Vertical Machining Department can provide you with high quality, precision machined parts at an economical price. To learn more about our Vertical Machining Services, please review the table below, or contact us directly.